You might think all those construction cranes and shiny new office towers sprouting up in Canada’s big cities would be lowering the boom on shared-space real estate operators. The reality is shared- or flex-space providers are doing just fine. This month, Regus unveiled its latest flex work spaces in Oxford Properties new MNP Tower and in the suburb of Surrey in King’s Cross at 7404 King George Blvd. With the new location in Surrey, Regus can claim a presence in all suburban markets in Vancouver. It says the need for the Surrey location was due to high housing prices, traffic gridlock and the Port Mann toll bridge providing entry to the downtown core. Regus has nearly tripled its size and scale over the last five years in Canada, Berger said. Worldwide, it was doubled from 1,000 to 2,000 centres in five years. “You should expect to see very similar growth over the next five years as we have done the previous five,” Berger said. Regus and its competitors are growing due to the same factors behind the office construction spurts, said Berger. Regus, which currently operates 80 flex-work centres (1.5 million square feet) across the country, has been forced to migrate its locations beyond the traditional hubs of the major city downtown cores, he noted. Regus is seeing a “real influx” of multi-national companies entering the Canadian market that are not yet ready to invest in a long lease. The firm is also finding new business in the form of existing companies giving up some or all of their current space in favour of flex space. Flex-work providers also continue to rely on lone practitioners or small groups of professionals who want a prestigious address close to the action, such as lawyers and accountants clustering downtown. Regus and other flex-work players say their business model is taking hold despite the general office building boom because their customer base of entrepreneurs, small businesses and large corporations is picking flexibility over traditional office spaces. It cites its own recent report which found 76% of Canadians say they have seen a rise in the remote working and 48% of global professionals are now working outside the main office at least some of the time. 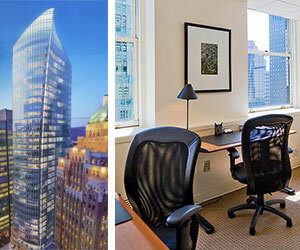 In the “old” days, Regus looked to rent out an entire floor of an office tower or the majority of a heritage building. Today it is shifting to offering sites in places like airports, rail stations, shopping centres and, in Europe, in service stations. The same market dynamics (rise of a mobile workforce and steadily rising prime real estate costs) has led Canadian-based iQ Office Suites to open its second Toronto location in the former Bank of Canada Building at 250 University. That is in addition to its first location, the Dineen building at Yonge and Temperance Streets, deep in the downtown core. The former Bank of Canada site features private offices, pods, dedicated desks and a 4,500-square-foot iQ members’ lounge housed in the former Central Bank’s bullion vault. Situated across from Osgoode Hall, it is expected to be a magnet for lawyers and other members of the legal community. Like giant Regus, little iQ Office Suites is finding plenty of opportunity among Toronto’s construction cranes. Willmott, who developed the iQ Office Suites business model after running a Toronto real estate business with business partner Alex Sharpe, takes “the more the merrier” attitude to the flex-work business.